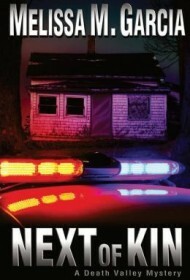 Detective Will Stellar is investigating the murder of a woman he grew up with, but after he’s thwarted at every turn by bureaucracy and department politics, an unknown town vigilante gruesomely takes matters into his own hands in Melissa M. Garcia’s Next of Kin. When his former schoolmate and suspected local prostitute is found beaten to death, Detective Stellar finds evidence that might incriminate the Lake City Police Department. Stellar, whose dedication to the law propelled him to arrest his own brother for drug possession, isn’t one to hide evidence, but he doesn’t want to rush into anything that might damage his department, either. Stellar’s case stalls, but before long, dismembered bodies start showing up in garbage bags, and the police realize they have a violent killer bent on vigilante justice in Lake City. The detective doesn’t know who he can trust, and soon turns to the most unlikely ally: Alex Delgado served 10 years in prison for killing the man who assaulted her, and her violent temper makes everyone in Lake City nervous. As Stellar gets closer to the vigilante, he must risk everything—including his career. Garcia’s writing is technically strong, and her skill with dialogue keeps the prose from growing too stale. Inconsistencies in character details may frustrate careful readers, however, and the slow pacing and easily predictable plot leave something to be desired for avid mystery fans. The antagonistic and fierce Alex Delgado stands out among a cast of somewhat stereotypical characters, though at times Alex’s explosive hatred of anyone with a badge becomes tedious. Overall, though, the narrative provides enough satisfactions to entertain those looking for an uncomplicated, modern day murder mystery.